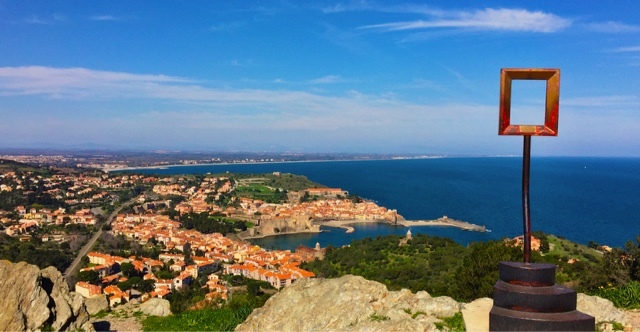 On this hill, overlooking Collioure by the shores of the Mediterranean, you have an option to frame your panorama photo of this village. As I understand it - looking through the frame you will have the same "picture" and motif that has been used by one of the former painters and artist that visited the village under the period of Fauvism - the "wild beasts"
Fauvism, the first twentieth-century movement in modern art, was initially inspired by the examples of Vincent van Gogh, Paul Gauguin, Georges Seurat, and Paul Cézanne. The Fauves ("wild beasts") were a loosely allied group of French painters with shared interests. Several of them, including Henri Matisse, Albert Marquet, and Georges Rouault, had been pupils of the Symbolist artist Gustave Moreau and admired the older artist's emphasis on personal expression. Matisse emerged as the leader of the group, whose members shared the use of intense color as a vehicle for describing light and space, and who redefined pure color and form as means of communicating the artist's emotional state. In these regards, Fauvism proved to be an important precursor to Cubism and Expressionism as well as a touchstone for future modes of abstraction.